Riding what is expected to be the final season of his long career, Alexandre Vinokourov has turned back the clock and won the Olympic road race in London. The Kazakstan rider beat Rigoberto Uran in a two-up sprint to the line, capitalising on a momentary gap in concentration from the Colombian, who looked behind him to the left at precisely the same moment Vinokourov jumped on the right. Vinokourov immediately opened a gap and while Uran tried to close it, he soon realised the opportunity was lost. Norway’s Alexander Kristoff had been clear for much of the race after clipping away in an earlier break, but had sufficient reserves to win a 23-man sprint for bronze. He beat an impressive Taylor Phinney (USA), Sergey Lagutin (Uzbekistan) and Australia’s Stuart O’Grady, who is competing in his sixth Olympic Games. That group formed after the final ascent of Box Hill, when several riders clipped clear of the British-led peloton, opened a gap before the summit and then mopped up other riders who had been ahead, including a lone Philippe Gilbert (Belgium). The Great Britain team of Mark Cavendish had kept things under control until that point, but then visibly fatigued and fell off the pace, enabling the 32-man break to pull ahead. While the German team gave some assistance in order to further Andre Greipel’s chances, the break was too committed and the gap opened to over a minute. Beijing Olympics silver medallist Fabian Cancellara (Switzerland) was part of the move and was tipped by many, but he misjudged a corner inside the final ten kilometres and went down hard. That took him out of contention and with the Swiss rider unable to put weight on his right arm, gave his supporters concern about whether he will be able to contest the time trial on Wednesday. He went for medical examination afterwards to see if he suffered any fractures. The win produced very mixed reactions, with his supporters celebrating a very big victory, while others pointing out that he tested positive for a blood transfusion in 2007, was handed a two year ban and never apologised for his actions. British hope Cavendish raced in as part of the main bunch, trailing Andre Greipel (Germany) and Tom Boonen (Belgium) to finish 26th. They were forty seconds behind the two leaders. A race predicted to end in a big gallop proved to be a more competitive one than that and Vinokourov, a rider known for his aggression, came out best on London’s Mall. However he had said beforehand that he felt sure he was certain to win if things came down to a sprint; that was likely one factor in why so many teams opted to send riders up the road and race so hard to make sure they’d stay away. A total of 144 riders lined out for the start of the 250 kilometre men’s road race, with British supporters hoping that the home team could control things for a win. After thirty kilometres of racing, the break was already two minutes ahead of the Great Britain-led peloton, which for some time was aided by Vasil Kiryienka (Belarus). The gap continued to grow and was a shade under five and a half minutes by the time the break hit Box Hill for the first time. Back in the bunch, a crash took down several riders, including the strong Lituanian Gediminas Bagdonas and the Spanish sprinter Fran Ventoso. Soon after the top of the climb, world time trial champion Tony Martin moved to the front, with Germany agreeing to British requests for assistance in chasing the break. Its sprinter Andre Greipel was one of the race favourites and wanted the move to come back. Martin was joined by former team-mate and past world champion Bert Grabsch, who also aided the chase. However the bunch remained over five minutes back on the second ascent of Box Hill. Several kilometres later, Australia’s Michael Rogers clipped away and opened several seconds’ gap over the peloton. He gradually pulled further ahead and crossed the Box Hill summit for the third time five minutes back; the peloton was a minute further behind there. Just over 140 kilometres remained at that point, and Rogers had a lot of chasing ahead if he was to continue trying to get across. However he was just twenty seconds ahead of the peloton next time round and was caught on the climb, his effort in vain. Tour de France third-placed finisher Vincenzo Nibali (Italy) surged clear on the fourth ascent of Box Hill, and was quickly joined by Belgians Philippe Gilbert and Greg van Avermaet. Martin Elminger (Switzerland) and Robert Gesink (Netherlands) also got across, making it five chasers. These rode hard up Box Hill but the peloton managed to bring them back after the summit. Less than a lap later, Ukrainian Andriy Grivko (Ukraine) attacked and was joined by Gregory Rast (Switzerland). Nibali and Gilbert then kicked clear again on Box Hill and, together with several others, caught the two just in front. Also present in the chase group were Grivko and Rast, Danish rider Jakob Fuglsang, Italy’s Luca Paolini, Lars Boom (Netherlands), Sylvain Chavanel (France), Jack Bauer (New Zealand) plus the Czech Roman Kreuziger. Just before the sixth ascent of the climb, the chasers had closed the gap to those out front to just under two minutes, and were 25 seconds ahead of the peloton. Duggan and Westra used the slopes to kick clear, trying to split the break up and get rid of any passengers. Roelandts and Pinotti got across, but the others soon reeled them in again. Nibali’s group was chasing hard and crested the summit one minute 15 seconds back, almost a minute clear of the peloton. The next time around the bunch was drawing closer, but an injection of pace by Gilbert and Nibali helped draw the break a little further ahead. The chasers finally caught the break with 70 kilometres remaining, just before the penultimate ascent of Box Hill. Pinotti had been waiting at the back for Nibali to get up to them and once that junction was made, he pushed the pace for several kilometres. Nibali, Gilbert and then an impressive Fuglsang took over. Back in the bunch, Alexandr Kolobnev (Russia) was concerned by the 45 second gap and attacked the peloton on Box Hill. Several of those from the front group drifted back and both he and they were just under 30 seconds back at the summit. The peloton was 53 seconds back, and trying to get back into control. However cracks were starting to show, and Britain’s grip on the race was slipping. Gilbert decided to play his card early and jumped clear, riding hard to get a gap before the final ascent of Box Hill. He drove the pedals around and had a clear advantage hitting the slopes, being cheered on by the huge crowds as he neared the top. While he’s nothing like the same rider as last year, he had a 43 second advantage over the chasers at the crest of the hill. Behind, two other groups wrested clear of the bunch on the climb and set about trying to bridge across. The first of those was one minute and three seconds back, with the second a further thirteen seconds behind. The Great Britain-led peloton was a further seven seconds back and struggling to keep things in check. With several strong riders in the chasing groups, alarm bells were ringing for Cavendish. These concerns proved well founded when the various groups coalesced and caught Gilbert 42 kilometres from the line, producing a very strong front group with a solid lead. The Spanish and Swiss riders were particularly active, driving things along for Alejandro Valverde and Fabian Cancellara. Wiggins was chasing hard behind and got assistance from Grabsch, but the gap was up to one minute with 34 kilometres remaining. The break was rotating very well, a marked difference from the bunch where a few riders were stuck on the front for a lot longer, and clearly starting to tire. Chris Froome ran out of gas with approximately 25 kilometres left, sitting up. The other British riders continued to chase but the gap was still 50 seconds with twenty kilometres remaining. It persisted despite the break’s unity being disturbed by attacks by Norway’s Lars Petter Nordhaug and Gesink. Cancellara was one of those to drive things along, realising that he had a big chance of taking a medal. However he got things completely wrong on a sharp right-hand turn after Richmond Park, misjudging the corner, hitting the ground and sliding into the barriers. The break lost some momentum but got going again; sadly for him, he was hurt and was unable to hold the bars with his right hand after remounting. With ten kilometres to go the break was still a minute ahead, making it clear that the bunch was not going to come back. The mood shifted from collaboration to attack and Fuglsang gave it a shot, only to be closed down. 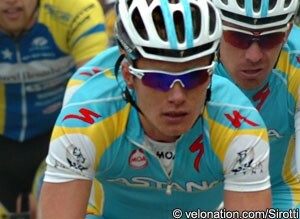 Vinokourov and Uran then played their cards, clipping away with eight kilometres remaining and opening a decent lead. Behind, the break started squabbling about the chase, with the thoughts of a bronze medal prompting some to save energy rather than giving everything to try to get the two leaders back. That was all they needed, and the duo went into the final kilometre with a sufficiently large gap to know that one of them would take gold. Uran made the crucial error of looking behind at the wrong time; Vinokourov capitalised on this, attacking hard on the right side of the road and opening his sprint with a lead of several bike lengths. He held this all the way to the line, beating Uran for gold. Kristoff got the better of Phinney, Lagutin and O'Grady, netting bronze. The main bunch was led home 40 seconds down by Greipel, who outsprinted Boonen and Cavendish. Each had hoped for a medal but with many riders so determined not to leave things to a bunch sprint, they had to settle for 27th, 28th and 29th. Needless to say, it wasn’t what they had in mind this morning.